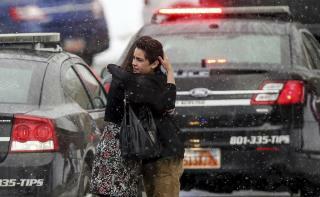 (Newser) – A Utah teenager who allegedly fired a shotgun into his school's ceiling Thursday morning was restrained and disarmed by his own parents, the AP reports. While police say the 15-year-old, who also had a handgun, discharged the shotgun in the hallway, at least two students say it happened inside a classroom during science class. Student Dan Fowers says the teen came in and fired the shotgun. "I looked up and there was a big hole in the ceiling," he tells KSL. Another student, Calvin Smith, tells the Salt Lake Tribune the shooter stood there looking angry for a moment before his parents burst in. Smith says the teen's dad tackled him while his mom took the gun away and dragged him into the hallway. Police confirm that the shooter was disarmed by his parents. The parents did the right thing. Also, I don't blame them for not having the guns locked up. They need quick access to them if there is an intruder in their home. That minute it takes to unlock the safe, could prove deadly. Thank goodness for the diligent parents!!!! Not like that one heifer in Sandy Hook that bought weapons for that psycho kid under her own name.. smh..
Time for an after school PSA.